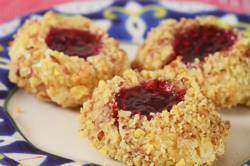 Thumbprint Cookies are a very popular holiday cookie. They are made with an enriched shortbread dough that is formed into balls and then rolled in finely chopped nuts or dried coconut. The name 'thumbprint' comes from the fact that you use your "thumb" to make an indentation into each ball of dough. The indentation is then filled with your favorite jam. Once the Thumbprint Cookie batter is made, if it is too soft to roll into balls, cover and refrigerate until firm. This can take anywhere from 30 to 60 minutes. Then form the dough into round balls. Next, each ball of cookie dough is rolled first in a beaten egg white and then in finely chopped nuts. The egg white acts like a glue so that the nuts will adhere to the cookie batter. You can use a variety of nuts; walnuts (my favorite), or pecans, hazelnuts, or almonds. I also like to first toast the nuts as it brings out their flavor. The last step is to make an indentation, using your thumb or the end of a wooden spoon, into the center of each cookie. Fill the indentation with about 1/2 teaspoon of your favorite jam. Now, some recipes do call for filling the centers of the cookies with jam after they are baked. This is best if you want to store the cookies for more than a few days because the jam does soften the cookies over time. Thumbprint Cookies: Preheat your oven to 350 degrees F (180 degrees C) and place the oven rack in the center of the oven. Line a baking sheet with parchment paper. In the bowl of your electric stand mixer, fitted with the paddle attachment (or with a hand mixer), beat the butter until smooth. Add the sugar and beat until incorporated. Add the egg yolk and vanilla extract and beat until combined. Scrape down the sides and bottom of your bowl as needed. In a separate bowl, whisk together the flour and salt. Add the flour mixture to the batter and beat just until combined. If the batter is too soft to roll into balls, refrigerate for about 30 to 60 minutes. In a small bowl, whisk the egg white until frothy. Place the finely chopped nuts on a plate. Roll the batter into 1 inch (2.5 cm) balls (15 grams for each cookie). Then, taking one ball of dough at a time, first roll it in the egg white and then roll in the nuts. Place on the prepared baking sheet spacing about 2 inches (5 cm) apart. Using your thumb or end of a wooden spoon, make an indentation into the center of each cookie and then fill (spoon or pipe) the indentation with about 1/2 teaspoon of your favorite jam. Bake for about 12 minutes, or until cookies are just set and the nuts have nicely browned. Remove from oven and place on wire rack to cool. Note: To toast the nuts. Spread nuts on a baking sheet and bake in a 350 degree F (180 degree C) oven for 8-10 minutes (walnuts, almonds, or pecans). The nuts are done when they are light golden-brown in color and fragrant. If using hazelnuts, bake them for about 12-15 minutes or until fragrant and the outer skins begin to flake. Remove from oven and cover the hot nuts with a clean dish towel. Let the hazelnuts sit (steam) for about 5 - 10 minutes then rub the nuts in the towel briskly to remove the skins. Let cool completely. Once the nuts have cooled, place them in your food processor and process until finely chopped (or you can finely chop them by hand). Makes about 19 - 20 cookies. Note: This recipe can be doubled.